Well I think it looks lovely. I’ve been making moss stitch cowls with chunky or Aran wool. You only have to alter the number of stitches and the needle size depending on which yarn you use and you keep knitting for approximately 60 cms and then sew the two ends together. I’m keen on putting two different weights of yarn together. A rather plain Aran colour can be lifted quite dramatically with a thin mohair/mohair effect wool, especially if the mohair is variegated. This makes the resulting cowl much softer to wear. Snoods, or everlasting scarves as my American friend calls them, can also be produced in the same way but I found that chunky wool does make them a bit heavy if you combine two yarns so I stick to Aran weight wool. You can spend a little time looking through old patterns for interesting rib patterns to knit them in – my favourite is one called ‘faggoting rib’ and it produces a lovely open effect plus, BONUS, it’s quick and easy to do! 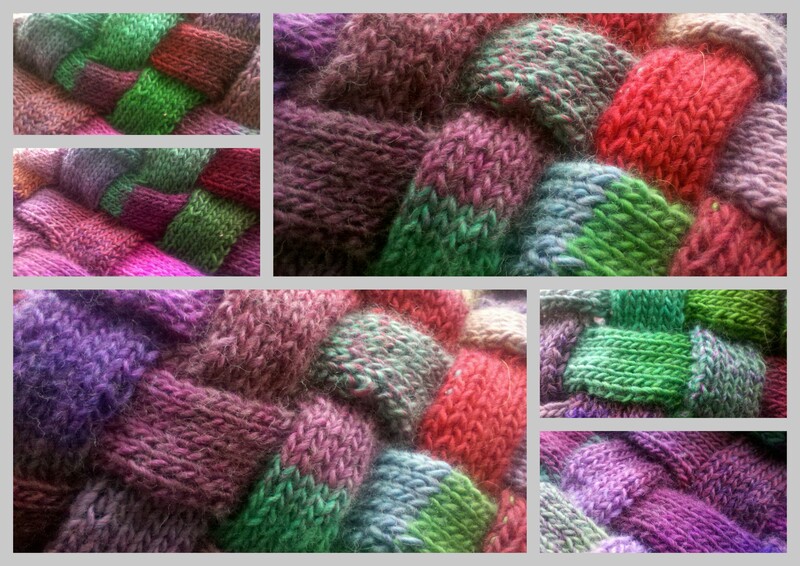 It looks great, Jane – I think Entrelac is *so* clever! Well done! Oh I so want to be able to knit this pattern, but I am not brave enough, perhaps I should be….. Love your knitting projects.